For other uses, see San Cristobal Island. Landscape in Punta Pitt, San Cristóbal Island. Young sea lion (Zalophus californianus wollebaeki), Punta Pitt. Main Street of Puerto Baquerizo Moreno. View of the island from the sea. León Dormido (in English : Kicker Rock). 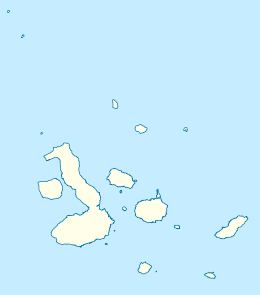 San Cristóbal (Chatham) is the easternmost island in the Galápagos archipelago, as well as one of the oldest geologically. It is administratively part of San Cristóbal Canton, Ecuador. Its Spanish (and official Ecuadorian) name "San Cristóbal" comes from the patron saint of seafarers, St. Christopher. English speakers increasingly use that name in preference to the traditional English name of Chatham Island, derived from William Pitt, 1st Earl of Chatham. San Cristobal Island is composed of three or four fused volcanoes, all extinct. It is home to the oldest permanent settlement of the islands and is the island where Darwin first went ashore in 1835. A small lake called El Junco is the only source of fresh water in the islands. The availability of fresh water is what led to the early settlement of San Cristobal. A penal colony was built on San Cristóbal Island in 1880 for prisoners from mainland Ecuador. This later turned into a military base for Ecuador and export center for the island's products including sugar, coffee, cassava, cattle, fish and lime. In April 1888 USS Albatross, a Navy-manned research vessel assigned to the United States Fish Commission, made landfall at an abandoned settlement on Charles Island. San Cristóbal has an area of 558 km2 (215 sq mi) and its highest point rises to 730 metres (2,400 ft). The population is approximately 6000. 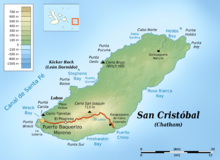 San Cristóbal is the most fertile island of the archipelago and is the second most populated after Santa Cruz. The capital of the archipelago, Puerto Baquerizo Moreno, lies at the south-western tip of the island. The island is served by San Cristóbal Airport, with daily flights from Quito and Guayaquil. Just 20 minutes from your nearest hotels and restaurants in the heart of San Cristobal. This island hosts frigatebirds, Galápagos sea lions, Galápagos tortoises, blue and red footed boobies, tropicbirds, marine iguanas, dolphins and swallow-tailed gulls. Its vegetation includes Calandrinia galapagosa, Lecocarpus darwinii, trees such as Lignum vitae, Matazarna. In the waters nearby are sharks, rays, and lobsters. The largest fresh water lake in the archipelago, Laguna El Junco, is located in a crater in the highlands of San Cristóbal, in the southern half of the island. The lake harbors a large population of birdlife, but reaching the lake requires a short uphill walk. Nearby, La Galapaguera is a breeding station and sanctuary for giant tortoises. The majority of inhabitants make their living in government, tourism, and fishing. Also the majority of the residents of San Cristóbal live in the port city of Puerto Baquerizo Moreno, which is the capital of the Galápagos province. Island tourism sites nearer the town of Puerto Baquerizo Moreno include the Cerro Tijeretas, a nesting colony for Frigate birds and a statue of Charles Darwin, marking the original site where he first disembarked in the Galápagos Islands during the voyage of the Beagle, on 16 September 1835. La Loberia, a colony of sea lions, lies about ten minutes by bus from the town. Local boat tours also take visitors to two popular nearby dive sites. "Kicker Rock" (the Spanish name is "León Dormido") represents the remains of a lava cone, now split in two. "Isla Lobos" (sea lion island) is also a nesting site for blue-footed boobies. Beach in Cerro Brujo, San Cristóbal Island. Yellow garden spider (Argiope aurantia), Punta Pitt. Common bottlenose dolphin (Tursiops truncatus) in San Cristóbal island. San Cristóbal lava lizard (Microlophus bivittatus), Punta Pitt. Large Painted Locust (Schistocerca melanocera), Punta Pitt. Libélula (Tramea sp), Cerro Brujo. Sea lion (Zalophus californianus wollebaeki) lying on a bench in Puerto Baquerizo Moreno, San Cristóbal Island. Sea lion (Zalophus californianus wollebaeki) in the coast of San Cristóbal Island. Galápagos brown pelican (Pelecanus occidentalis urinator), Cerro Brujo. Chick of blue-footed booby (Sula nebouxii), Punta Pitt. Adult blue-footed booby (Sula nebouxii), Punta Pitt. San Cristóbal Galápagos tortoise (Chelonoidis chathamensis). ^ a b "San Cristobal Island". Encyclopædia Britannica. ^ a b c "San Cristobal". Galapagos Conservancy. ^ "San Cristóbal Island". Encyclopædia Britannica. ^ Larson, Edward J. (2001). Evolution's Workshop: God and Science on the Galápagos Islands. New York, New York: Basic Books. p. 108. ISBN 0-465-03810-7. The ship’s captain report “great numbers of cattle, horses, mules, donkeys, sheep and hots were running wild” where native species once flourished, and a new sugarcane plantation and cattle ranch on Chatham Island that also encroached on wild habitat. Wikimedia Commons has media related to San Cristóbal (Galápagos). This page was last edited on 6 February 2019, at 21:39 (UTC).